Stellar Kart's focus on youth drives its music and purpose. 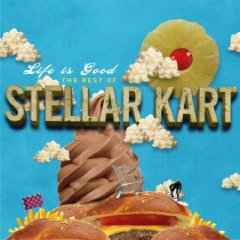 Steller Kart consits of 4 guys who range in age from 20-24,The Phoenix-based pop-punk band hearkens back to its youth group roots with an album that is both edgy and fun while addressing relevant teen issues. Adam Agee (vocals, guitar), Jordan Messer (drums), Cody Pellerin (guitar) and Tay Sitera (bass) grew up playing music. The four friends came together and indeed it all start in a youth group. Frontman Agee and drummer Jordan Messer led worship, while bass player Tay Sitera joined them for weekend gigs. Stellar Kart added Pellerin to the line-up about three years ago to form a worship band at Mt. Ridge Baptist in Glendale, Arizona., which quickly developed into their now full-time ministry. 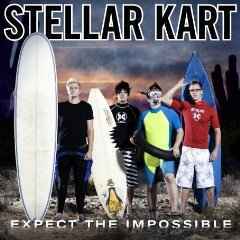 For the past two and half years, Stellar Kart has stayed busy performing close to 300 youth events, most of them on the West Coast. The foursome has toured alongside By the Tree, Jeremy Camp, Building 429 and Across the Sky, among others. 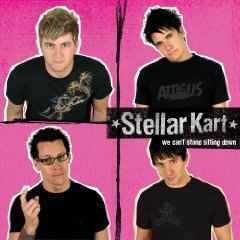 Steller Kart takes its new role seriously as it prepares to impact youth nationwide with its unique blend of straight-ahead power pop/punk songs and simple message with its debut Release date: 2/15/05. 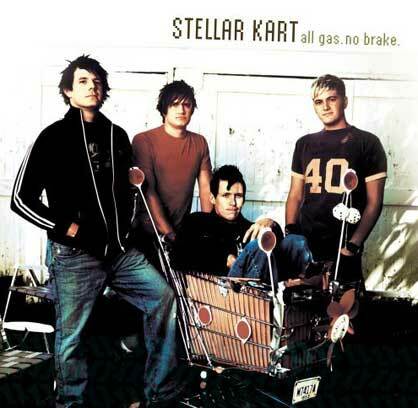 New Word/Curb/Warner Bros. Records signing Stellar Kart is raring for the release of its label debut, All Gas. No Brake. Stellar Kart easily identifies with the challenges facing today's youth. "There are so many high school and junior high kids living a life with no direction," comments Stellar Kart guitarist Cody Pellerin. "If we have the opportunity to offer some guidance based on our recent experience, that's great. I really enjoy using music as an opportunity to relate to youth." Playing music for kids is the real reason behind their camp craze, and new Word Records power pop-punk band. Stellar Kart has a mission to connect with youth. "We love camps because we're right there with the kids," says lead guitarist Cody Pellerin. " I really enjoy using music as an opportunity to relate to youth." "It's the best possible venue to meet kids one-on-one," says Adam Agee, Stellar Kart's lead singer. "Sure, they might think you're cool because you play in a band, but they see that you still have your head on straight, that you can be a Christian and still rock." Stellar Kart is now raring to carry its mission beyond camp borders. With an album title that means "full speed ahead," All Gas. No Brake drives the group's music and message forward, encouraging high schoolers to go all out for God. 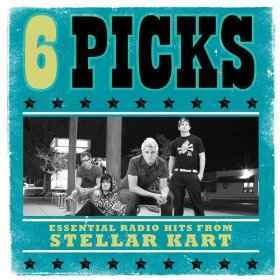 Even in thoughtful moments, however, Stellar Kart keeps its music high-energy and singable. Like the record's title suggests, these guys live life at full speed. This is evident in the group's musical style, which has been likened to bands such as Relient K, Greenday and Blink-182. "Tree Climber," only 23 seconds, is a fast-paced yet short-lived song about Zacchaeus. Other fun moments on All Gas. No Break include the camp song "Gone Fishin'" and a remake of Bon Jovi's classic hit "Livin' on a Prayer." Written and produced entirely by Stellar Kart, All Gas. No Brake offers 11 lively tracks. Many Stellar Kart songs focus on matters of personal faith, like setting aside time for God or learning to trust Him completely. Others speak to social themes that confront teens. "Second Chances," for example, originated from Stellar Kart's ongoing work with Silver Ring Thing, an abstinence program, while "Superstar" is a song about suicide. Stellar Kart also addresses pressing matters in the lives of teens using its own distinctive style. The energetic "Superstar" is actually a song about someone considering suicide. Says Messer, "I've had friends that died from suicide, so I felt it was an important issue to address in a song. So many people are not feeling the love of Christians around them. We wrote 'Superstar' to stress how crucial it is for us as a family to reach out to others." The first radio single from All Gas. No Break, "Spending Time," goes for adds on both Christian Hit Radio and Rock radio in January. Stellar Kart will additionally be featured on a major market tour this spring. This pop-punk band Stellar Kart will open for Tooth & Nail/BEC Recordings rock act Kutless on the "Strong Tower Tour" next month. The tour, which coincides with Stellar Kart's debut album release, All Gas. No Brake, is scheduled to hit more than 20 major markets through mid-March. The top-notch lineup guarantees music to appease rock fans of all appetites. A complete tour itinerary follows this release. "The 'Strong Tower Tour' with Kutless, BarlowGirl and Stellar Kart is going to be a great run," comments Mike Snider of Third Coast Artists Agency. "This is a youth-oriented package with a ministry focus that represents different demographics. It's perfect for the touring market, and all early indications point to strong response and sold-out shows." Through its work with youth, the band says that it continually meets kids who think they're unforgivable. It wrote "Second Chances" to remind those kids that no matter how many times they mess up, God will always provide a second chance. The song originated from Stellar Kart's ongoing work with Silver Ring Thing, an abstinence program. Silver Ring Thing puts on high-tech presentations full of video, music, comedy skits and light shows to encourage kids in abstinence. Stellar Kart takes this new role seriously, as it prepares to impact more with All Gas. No Brake. "It's a huge deal," Agee says. "No one's perfect. We can only help others if we ourselves are committed to holding each other accountable and staying in the Word. It's definitely not easy. It's just something you make a conscious decision to do, and we have." "There are so many high school and junior high kids living a life with no direction. If we have the opportunity to help them, that's great. It fires me up, keeps me grounded to think about how God's using me to help other people." A little about the group Adam Agee (vocals, guitar), Jordan Messer (drums), Cody Pellerin (guitar) and Tay Sitera (bass). Adam B. Agee is 24 his home town is Phoenix, Arizona. Adams Musical influences would be: Green Day, Simple Plan, The Starting Line, Audio Adrenaline, Delirious, Switchfoot, Journey, Gin Blossoms... Agee's hobbies are: golf, basketball, football, hunting, fishing, hanging out with his wife. Agee attended four different high schools in four years and had to deal with meeting new people and making new friends each time my family moved. Through church and youth group I was able to make friends and still have a good high school experience. Advice for youth today "Don't worry about what others think of you. Learn a second language. Play an instrument. Have fun with life and don't take anything for granted." Taylor Sitera... Taylor Dean Sitera age 22, his nickname in the band is Tay. His home town is Phoenix, Arizona. Tay biggest influence is his dad. His Musical Influences are Simple Plan, The Starting Line, Blink-182, Box Car Racer, Sum 41, Taking Back Sunday, Audio Adrenaline, Beatles, New Found Glory. Sitera's hobbies are: riding mini dirt bikes, movies, painting, sleeping, cleaning, hanging with friends. Advice for youth today... Take everyday one step at a time, and always be true to who you are. Random personal fact "I straighten my hair because if not I'd have a fro." Jordan Bradford Messer is 22 years old and goes by the nickname CON-MIGO in the band. Jordan's home town is Phoenix, Arizona. Jordan's Musical influences are: Travis Barker, Cyrus Bolooki, Tay Sitera, Adam Agee, Cody Pellerin. Let's see who else... Box Car, Racer, Simple Plan, Audio Adrenaline, TFK, Green Day, The Starting Line, Taking Back Sunday, ummmmm "oh yeah, Hillary Duff, Avril Lavigne and all the other pop stars. Messer's hobbies are: I like to ride my go-ped, eat, drum and sleep. And I'll always find time for shopping! Advice for youth today... Wake up every day and ask yourself this question, "What can I do to further God's kingdom?" Listen to His answer. Go out and show nothing but unconditional love for everyone you see or think about. This world is falling short of what it could be. There are people all around who have lost hope. Let's show them love; let's tell them that God is right by their side, waiting for them to accept! HE will take all of our worries and be there for us at ALL times. Everyone who suffers shall be set free by God's grace. We need to rise up today and not be afraid or ashamed of what we believe. No one can stop us because the MAKER of all things is on your side, my side, our side! Cody Pellerin... Cody Pellerin is 22 years old, his band nickname is Shredder and his hometown is Glendale, Arizona. Cody's Musical Influences are: everything from Simple Plan to Mozart and his Hobbies are: working out, longboarding, playing the guitar. Advice for youth today... Put your trust in Jesus and don't worry about what others think. Talking with kids about life and second chances is what motivates Stellar Kart. "Junior high and high school were really difficult for me," says Pellerin. "Not being a Christian, those years were just a train wreck. I accepted Christ right before I turned 18. I went to a camp two weeks later, and it was life-changing.